SunIZup helps you to know the timings of the various Sunlight phases including the Golden Hour and Blue Hour (also known as Magic Hour by photographers and cinematographers) for any selected location and any given date. 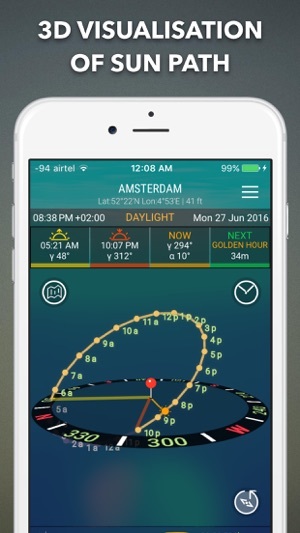 The timings are calculated in the app by determining the sun's position and path at the given location on the given date. It is a proven fact that Landscape photography during the Magic hour results in significantly better photos than pictures taken at any other duration of the day. * Enhanced for 3D Touch. The Magic hour period usually occurs around sunrise and sunset, when the sun is down near the horizon, sunlight travels through a greater depth of atmosphere, reducing the intensity of the direct light, so that more of the illumination comes from indirect light from the sky, reducing the lighting ratio. More blue light is scattered, so if the sun is present, its light appears more reddish. In addition, the sun's small angle with the horizon produces longer shadows. 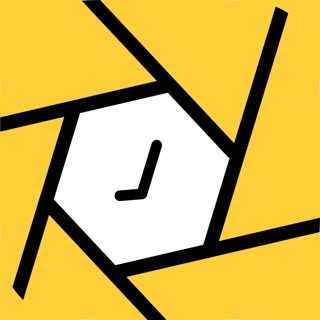 The app has a built-in database of over 50k locations around the world from which you can search and find the timings of the Golden Hour for that place. 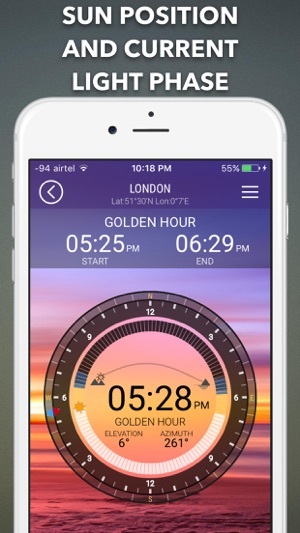 Apart from knowing the Golden Hour and Blue Hour, SunIZup helps you to find the sun's current and future position too, just rotate the dial to know the sun position during the day. The sun position information includes the sun Elevation Angle and Azimuth through the chosen date. 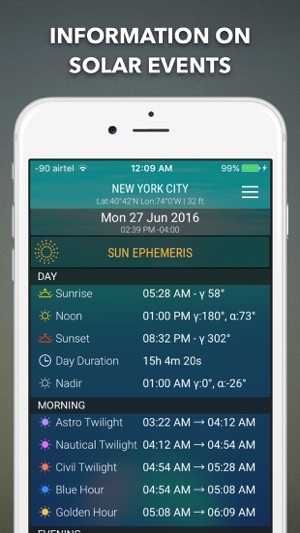 In addition to this, you can set alerts within the app to be reminded of the MagicHour. You can also view times of the different light phases during the current day or any other date in future or past. 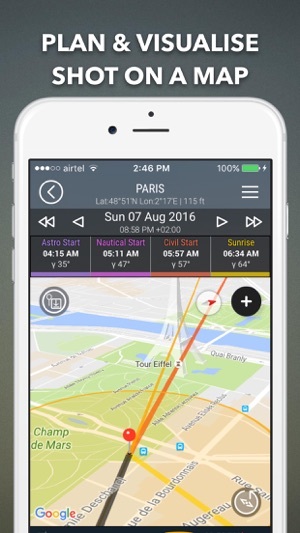 the app also shows the sunrise and sunset timings for the current selected location. All the data related to locations, notifications etc. 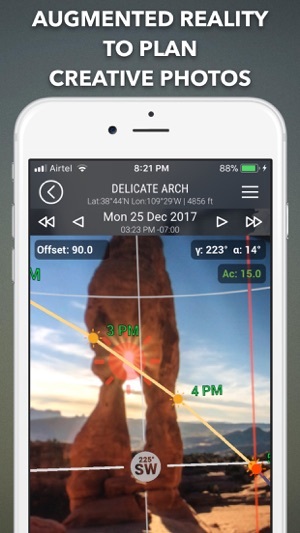 is kept on your device and is not transmitted or stored remotely, Further, All calculations of the sunlight phases are done on the device within the app itself. Also included is a companion App for the Apple Watch which shows the relevant data for the selected location and also provides alerts which can be set on the phone. This is really top notch for so many reasons. The detailed breakdowns on this are really top notch. Will make planning things so much easier. 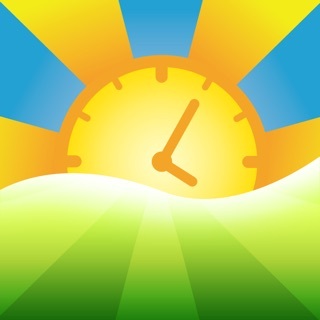 Would love some reoccurring alarms so say, every day I get an alarm 1 hour before sunset or other significant solar times that can’t be set by conventional means because they change every day. Add in some IoT hooks for say, Apple’s Workflow app, and it would be mind blowing.